Starting out in Everglades City, we kayaked the area known as 10,000 Islands. 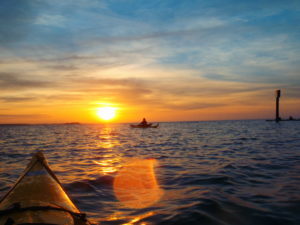 We paddled in the Gulf of Mexico each day and spent each night on one of several islands. This being an Outward Bound trip, think sleeping bag and bug tent not Heavenly Bed™ and room service. The accommodations were rustic (and I’m being generous here), the bugs relentless, the camaraderie among the group impressive and the opportunities to learn about oneself endless. As part of the experience, we had a solo night in which we were alone for about 24 hours in an isolated section of the island. You get to have a whistle in case you need to call for help, but otherwise you are to be alone with your thoughts and the elements. The near full moon that night was breathtaking over the ocean. Sadly, it also allowed for a much clearer picture of all the critters rustling about in my midst. Rational mind: they won’t bother me if I don’t bother them. Irrational mind: I’m alone in a poorly rigged bug tarp with no protection from a raccoon ambush. In fielding a lot of questions along the lines of “Why on Earth would you want to go do something like that?” I was able to answer easily…for the experience. When is the last time you sought out a new experience, profoundly developmental or otherwise, just for the sake of doing something new/different? Given our comfort-addicted culture (of which I certainly include myself), I’m imagining a lot of people don’t bother seeking out this kind of thing. Pretty understandable given people’s dedication to their profoundly comfy comfort zone – it’s how it got its name after all. It’s comfortable. But what might it be like if you were willing to step outside of your normal routine and try something different? While the Outward Bound experience isn’t for everyone (though it is a requirement if you are one of my daughters), there are myriad ways in which you can expand your horizons in the name of personal enrichment. While something as small as taking a different route home from work or rearranging your office can be a small step on the path I’m talking about here, what I’m actually suggesting is an experience that will take you out of your normal and predictable patterns as a chance to learn about yourself. What’s on your bucket list and when’s the last time you checked something off? It doesn’t have to be epic – you don’t have to bike cross-country or climb Kilimanjaro. You could decide to take up ballroom dancing or learn French or slip out of work to see a movie. The point is that you step out of your normal routine and have the opportunity to mine the nuggets that a new experience inevitably offers up. Don’t wait for terminal illness like Morgan Freeman and Jack Nicholson did in the 2007 movie The Bucket List. Put another way…life is short, eat dessert first. Postscript: My older daughter did a 2-week OB course the summer before her junior year in high school and LOVED it. My younger daughter (currently a sophomore) is actively trying to figure a way out of this “graduation requirement” from the Friou household.